2106 Woodside Avenue Anderson, SC. | MLS# 20207932 | Lake Hartwell real estate homes and lots for sale. Real estate agents offering expert knowledge of Lake Hartwell. Licensed in both South Carolina and Georgia to sell Lake Hartwell Property. Anderson, Clemson, Lavonia, Hartwell, Seneca, Toccoa, Martin. Available for showing effective 9/15/2018 after 9 AM - no appointments before – make your appointment now - - will not last long. 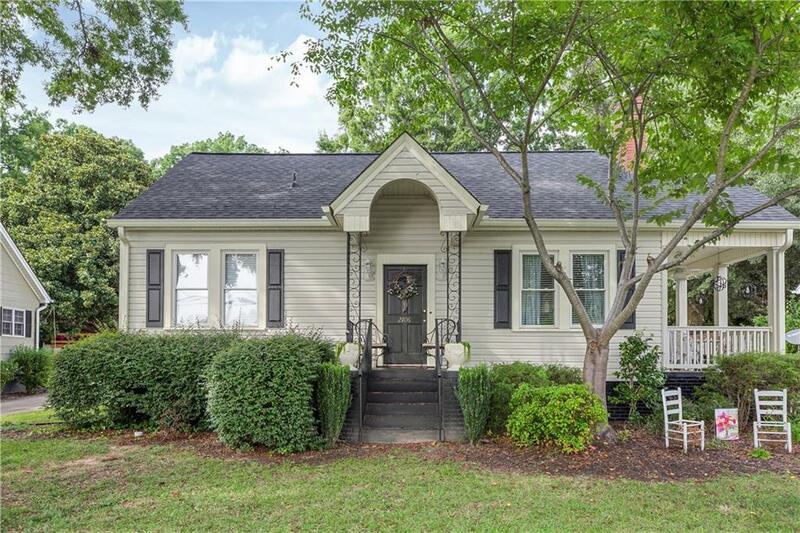 Lovely cottage with all of the charm and character you would expect from a home of this age – WITH ALL OF THE DESIRED FEATURES OF NEWER construction. 3BR/2BA, formal dining room and living area with 9+ foot ceilings, triple crown molding. Master bedroom on the main floor with crown molding, a walk in closet and huge master bath with a walk in shower, jetted tub, and upgraded vanitiy. Hardwood, ceramic and laminate wood floors throughout - - no carpet in this home. Plaster walls and ceilings downstairs. The kitchen was upgraded this year with all new stainless appliances. Adjoining the kitchen is a laundry room – the owner had all of the vacant space converted with premium closet organizers to provide tons of pantry space. Upstairs are two additional bedrooms, an upgraded bathroom, and a sitting area that is perfect for a play area or office. Outside you will find a fenced back yard (6’ vinyl fencing placed in 2016 providing tons of privacy) , a separate detached 1 car carriage style garage, a utility shed, and a small deck perfect for grilling. There is also a side porch off the living area to enjoy that afternoon beveragel or that morning cup of coffee with maintenance free vinyl railings. New (2018) downstairs Trane Heat Pump, Roof new in 2015, new gutters in 2016, Vinyl fencing in 2016 – Please see associated docs for a complete list of features/updates. Owner has meticulously maintained the home since purchasing including annual termite inspection and semi-annual heating/air inspections. Must see property to appreciate all it has to offer. Seller is furnishing a one-year upgraded America's Preferred Home Warranty with acceptable offer.